The Inspector General of Police, Mr Ibrahim Idris has refunded N6million extorted from an Anambra businessman, Mr Ugochukwu Oraefo by operatives of the Special Anti-Robbery Squad(SARS) after he was allegedly abducted in May this year. 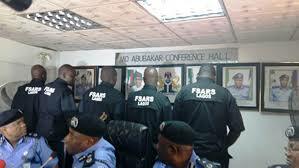 The executive director of International Human Rights and Equity Defence Foundation(I-REF), Barr Justus Ijeoma has recounted a chilling story of how SARS operatives in Anambra allegedly abducted a businessman, Ugochukwu Oraefo and extorted a total of N6million from him. Ijeoma, a human rights lawyer who briefed journalists in Onitsha Wednesday, however, said that the money extorted has been refunded, following a petition his group sent to Ithe Inspector General of Police, Ibrahim Idris. He had petitioned the IG over the abduction of Oraefo by three operatives of SARS from Anambra who refused to disclose to him his crime, except that he paid ransom to some people in 2013 without involving the police. They asked him to pay the sum of N20million before he could regain his freedom. Ijeoma said, “The victim was locked up for six days and heavily tortured by the operatives who did not disclose to him his offence, but merely asked him to pay the sum of N20million to regain freedom or be killed. “On the fifth day of his detention, the operatives carried out what could be termed as mock execution on him. They blindfolded him and drove him for a period of three hours, then they got to a spot which he suspected to be somewhere around Edo State. He said it was after the mock execution that the victim went into negotiation with them and finally paid N6million before he was released. Ijeoma said his group petitioned the IG in July and “As I speak to you now, they have paid back the sum of N5.98million, while N20,000 was kept back for a reason we do not know. “The reason we are briefing you today(Thursday) is, however, because as we speak, despite overwhelming evidence against the officers, no sanction has been meted out to any of them and all are still in their previous postings. “We urge the police authorities to expedite action on the investigation process and action taken against those found culpable to serve as a deterrent to others,” the group called. Ijeoma regretted that despite efforts to reform the police, the force has remained rotten, as the ‘ransom’ extorted by the errant operatives was delayed unreasonably by officers at the force headquarters after it was recovered, as they tried to keep back part of the money, despite the pressure mounted by the group.